Interviews can be tough for all candidates, but for people in sales, they represent a particular challenge. After all, if you work in sales, it's your job to sell––your most essential qualification is your ability to convince people to purchase products or ideas that may be new to them. So when you're interviewing for a role, interviewers will expect you to bring all those skills to the forefront and sell yourself. During interviews, you can expect several questions about why you work in sales, from why you like it to what motivates you and more. For interviewers, your responses to these questions will be a test of your research abilities - preparation is essential for success in sales. The more specifics you share, the clearer it will be that you've done your homework and are familiar with the company and its product. Being specific demonstrates that you're interested in this particular sales position (as opposed to any sales role that will hire you). If your prospective employer's products or goals don't get you fired up and motivated to sell, then you're likely not a good fit for the job. But beyond the product, salespeople can be motivated by other factors, too. By asking this question, interviewers want to get a sense of makes you tick as a salesperson: Does money make you get out of bed in the morning? Do you like the challenge of selling something you've never sold before? Are you all about competition with your colleagues and a drive to surpass their sales? Be honest about your answer. If it's money and the company is driven to hit killer numbers month over month, this is a good thing in their eyes. If it's competition and they post a monthly tally of everyone's sales to keep people on their toes, you'll be driven to work hard. In your answer, you can mention your positive feelings about the product. Or, talk about specific aspects of the role or company that you're particularly well-suited for. This is a great opportunity to share any similar or relevant sales experience in the product category or to the company's demographic. See some sample answers that you can use to help you practice your own response. "I'm an avid amateur golfer, and I find your company's products to be superior and affordable for the average golfer. I believe selling something that I personally enjoy using so much makes me even more effective as a salesperson." Why it Works: This answer ties the candidate's personal values and interests into the answer, giving the hiring manager a taste of his personality. It also demonstrates his knowledge of their product through first-hand experience. "I have worked in this territory for many years and would welcome the opportunity to use my contacts and experience selling a superior product such as this." Why it Works: This answer demonstrates the candidate's experience in the industry while also focusing on the role of the product. "The opportunity to utilize my experience in international sales is what interests me most about this global position." Why it Works: This answer gives a very specific reason which demonstrates the candidate's research and passion about the position. It possible sets her up for a follow-up question involving international sales. "Your company has an outstanding track record in customer service which I greatly admire. I have broad experience selling to your customer base and I know how to feature the customer service component. For example, I developed a campaign last year that focused on the importance of customer service." Why it works: This shows the candidate's research and knowledge of the company while also demonstrating his own experience in the industry. "I am continually motivated by the challenge of selling something new. Crafting a pitch and landing a new client is a satisfying process that never fails to excite me." Why it works: This clearly shows the candidate's passion. The candidate also uses specific duties from the description which shows his research, along with his passion. Would You Buy It? : Prior to interviewing for a sales job, always ask yourself if you would buy the product or service. In sales, just as in life, you can't sell something that you don't believe in. Also, never take a sales job if you don't have confidence in the marketing department (if applicable) or the current marketing structure and tools. A poorly written, poorly programmed website makes for a hard sell, especially if your competitors have new ones. Be Prepared for Rejection: Understand that in sales, just like in job searching, there is going to be rejection. This point is especially aimed at the younger employment seeker who is thinking about a career in sales. If you want to do sales, do it. Once you get past your first few rejections and your first few botched cold-calls, it becomes second nature. Don’t let shyness or fear of rejection stop you from entering the field. It’s an amazing way to begin your career. 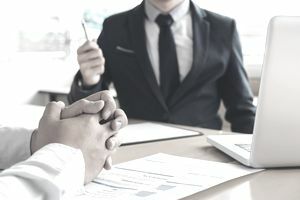 Focus on Consultative Sales Skills: Remember that sales employers always want somebody who has what is most commonly referred to as a "consultative selling" approach. More or less, the term refers to a sales style that aims to uncover the client's needs as opposed to the infamous sales style portrayed in the film Glengarry Glen Ross, which was most famously known for the mentality that, regardless of what the client wants or is best for them, close the deal. To express this unethical sales methodology in both an entertaining and theatrical manner, playwright David Mamet scripted the infamous "A.B.C." or “always be closing" line. The Employer Is Your Partner: Salary negotiation is the #1 most difficult aspect of the job search for many applicants in the sales and marketing arena. If you are not trained in negotiation, use what we refer to as the "work with" method. It means having the mentality that the employer is your partner, not your adversary, and together your job is to work towards a solution that will have you employed by the firm. If you think of negotiation in terms of winners and losers, you're going to end up the latter. Many questions about working in sales are open-ended, but that doesn't mean every answer is a good one. In your response, keep the focus on the company, position, or product. Do not focus on what the position will do for you. That means, don't say "I'm interested in this position because it offers a high salary." That may be one of your motivating factors for applying for the role, but it's not very compelling for interviewers. Research the position: Be as specific as possible in your answer. Be Honest: This is a chance to demonstrate what motivates you and your passion will automatically reflect in your voice. Review the Sample Answers: They'll help you get to the perfect answer. Keep the Focus on the Company, Position, or Product: Do not focus on what the position will do for you.